To celebrate the 50th anniversary of Michael Powell's Peeping Tom, Curzon Cinemas have announced a very special screening of the film followed by acclaimed filmmakers Martin Scorsese and Thelma Schoonmaker and Powell’s son Columba Powell in conversation. 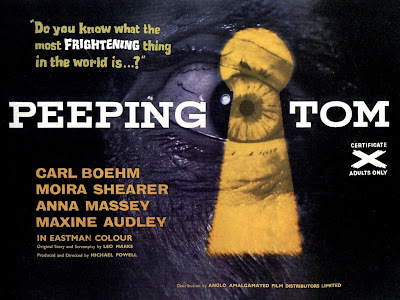 Peeping Tom was, upon its release, one of the most controversial films ever made in Britain. Powell’s career never recovered from the scandal, but twenty years later, Peeping Tom was hailed as a misunderstood masterpiece – thanks to the efforts of filmmakers such as Martin Scorsese, who helped finance a wider US re-release. The event will be hosted by Francine Stock. Francine Stock is the presenter of BBC Radio 4’s The Film Programme. Formely presenter of Newsnight and Front Row, Francine was also nominated for the Whitbread First Novel award for her debut book, A Foreign Country. Peeping Tom - By day, Mark Lewis works as a modest focus-puller in a film studio. But he also shoots glamour photographs for a seedy Soho newsagent, and by night he seeks victims for his most gruesome obsession – filming the face of mortal fear, moments before death. Directed by Michael Powell, the acclaimed director of A Matter of Life and Death and The Red Shoes.